That days drone elsewhere. " - Christina Rossetti, 1830 - 1894. 'Love Parks Week' this year runs from 24th July - 3rd August . The aim of the week is to "raise awareness of the importance of parks and green spaces, showcasing the benefits they bring and highlighting the need for continual investment and engagement", especially at a time when public funding has been reduced. I live a stone's throw from my nearest park which I am lucky enough to be able to see from my kitchen window. It isn't a huge space but is a welcome oasis of green in an area where new homes have appeared at an alarming rate in the last year or so, all swallowing up previously undeveloped land. It's a spot where children go to feed the ducks and to play, informal sporting activities take place, dogs are exercised, office workers sit out and enjoy their lunch and newly weds have their wedding photos taken. 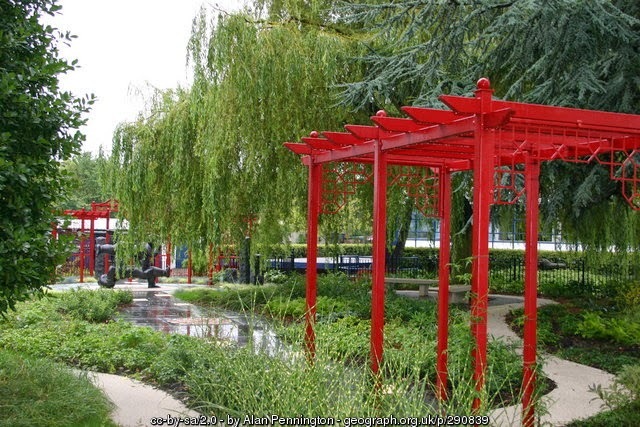 It even has its own 'Friendship Garden' (see above photo) which was created to celebrate twinning with a Chinese town. The park is also used throughout the year to host an increasing number of community events. You can support 'Love Parks Week' in a number of ways. There are special events going on in parks up and down the country this week - see the 'Love Parks Week' website and the 'Love Parks Week' Facebook page. You can complete a park health check of your nearest park. You could also make time to sign the UK Parks Petition which has just been launched by the The National Federation of Parks and Green Spaces. It aims to help makes the funding of parks an election issue for political parties in the run up to the next general election. Above all if you have a neighbourhood park please use it, don't lose it! An abundance sounds so much more attractive than a glut, so this year I have an abundance of courgettes. Whilst last year's crop was abysmal this year's harvest has been the complete opposite. I've been picking courgettes since the end of June just before we went on holiday. This last week has seen multiplying furiously as well as seemingly doubling size almost overnight. Although I sowed three varieties back in April I have only planted two varieties at the allotment namely the old stalwart 'Romanseco' and 'Floridor'. 'Romansesco' produces long green ridged courgettes whilst 'Floridor' sets forth sunshine coloured globes. I did plant four plants though and it's just as well that one plant is not producing at the same rate as the others. In fact it seems as if it is still in first gear which is just as well. It's probably just as well that my 'Brice' seedlings floundered at an early stage, so did a later sowing of another round green courgette, although one plant of the latter is just about hanging on. You can have too much of a good thing. So what to do with the half dozen or so courgettes that came home with me yesterday morning? It was way too hot to attempt any gardening activities so I decided to do some baking and made a courgette loaf cake. My brain was probably not in gear as I ended up glowing profusely in a warm kitchen although we did enjoy a slice of my creation later in the day. There are various recipes for courgette based cakes. I used this particular recipe from the BBC Good Food website. One or two commenters suggested that the cake needed longer in the oven than the time suggested by the recipe. I cooked it in a fan oven and did not find this to be the case. There were also some remarks suggesting that the cake although pleasant could do with more flavour. Himself and I agreed with this and if I try it again might well add some orange zest to the recipe. There are also versions of courgette cake which include chocolate - mmmmmmm. The recipe took care of one almost marrow sized courgette plus a smaller one so I still have three stripy green courgettes plus one yellow football to contend with. Anybody like a courgette ... or two .... or would you rather join me for afternoon tea? 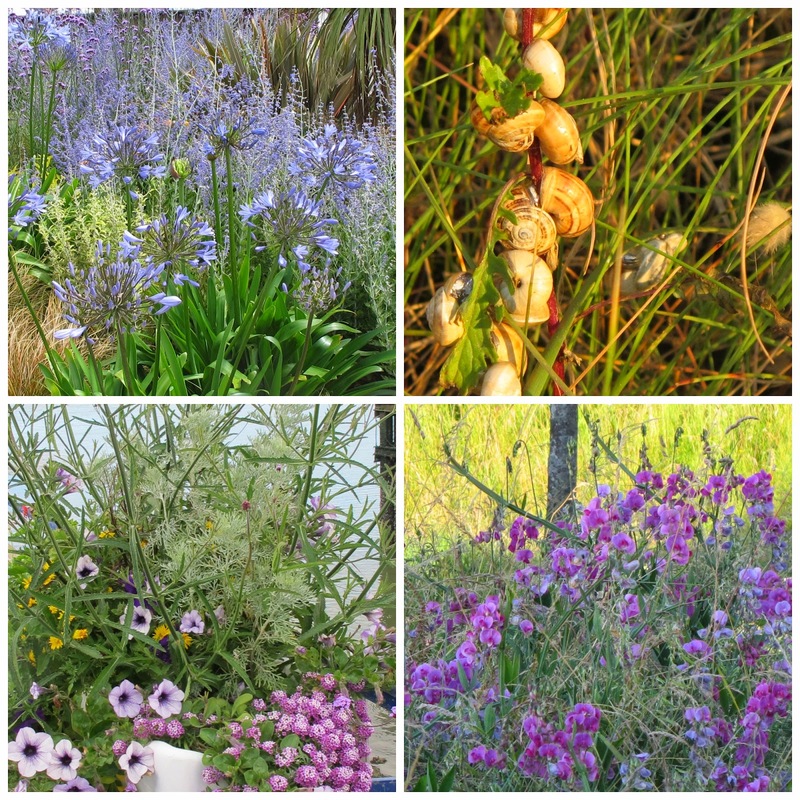 Wordless Wednesday ~ 23rd July 4014. The wettest of imaginable days in the city of Bayeux, where we saw the fabulous Bayeux tapestry and experienced a medieval fair complete with local folk dancing and the most scariest looking of stilt walkers. Staying the night in the little port of Port-Bail on a campsite where camper vans can park up about hundred feet or so from the sea. Here we witnessed a glorious red sunset slowly seemingly dipping into the sea and we went to sleep to the sound of waves. Having our faces painted with the colours of the French national flag as we sat and sadly witnessed 'Les Bleus' premature exit from La Coupe du Monde. Gazing down upon the small town of Arromanches, famous for its artificial 'Mulberry' harbour. Flags flying from outside public buildings, shops and houses throughout Normandy to commemorate the 70th anniversary of the Liberation of France. Shell strewn beaches and vivid red poppy dotted field edges. The imaginative roundabout plantings which are impossible to photo but live in the memory. Enjoying the odd dish or two of 'crevettes roses' accompanied by a small pot of mayonnaise and bread. Sheer bliss despite the rather messy process of eating them and the aftermath of sticky pink fingers! Experiencing my first and probably last ever pop festival at Beauregard (way,way too crowded for me), where the music of the talented Agnes Obel was the highlight of the proceedings for me. Himself prefered the rather more loud and strident tones of Seasick Smith. Drifts of lathyrus vernus on roadside verges, clumps of brilliant shining blue agapanthus and magnificent hollyhock towers. A cluster of snails out for an evening constitutional and a touch of late sunshine. We also fitted in one garden visit which I will touch on soon. Quite the best outcome of our holiday was that himself, who has been rather poorly since the beginning of April has returned home much fitter. Partly in response to medication but also partly due to the holiday I think. Now it's back to catching up with what's been going on in the allotment and garden. The weeds have certainly grown whilst I wasn't looking so I think that I will be playing catch up for some time to come.